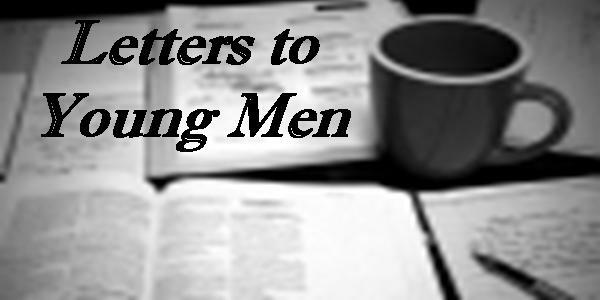 I’m starting a new blog series entitled, “Letters to Young Men.” I hope to post on this topic once every other week or so. Though I’m not particularly old, I have been blessed and encouraged to share insights with several guys in their late teens to early 20’s in regard to life and ministry. Some of you live in far away places and we talk only a few times a year; most of your mentoring is behind you, yet we check in from time to time. Others of you live in closer proximity and we meet on a weekly or monthly basis. Many you who read this post won’t know me, but hopefully you will be blessed through the series, feel free to contact me. Many of the lessons I will share here I learned the hard way. When appropriate, I will share my failure in hopes that you will miss a few bumps along the way. A precious few lessons I learned under the hand of various mentors in my own life and thus avoided the scars and bruises I would certainly carry apart from their influence. When appropriate I will give them credit and honor for their influence in my own life. I publish these thoughts to honor, educate, and encourage young men through the trials of life. I will write them as letters. They will be addressed, “Dear Friend.” My intention is not to share particular conversations that have taken place in private. The letters will address subjects that are in some way particular to young men and have developed over many conversations with many people. My goal is to produce letters that appear personal in nature and cover themes that are certainly relevant. My prayer is that these open letters are a source of strength and encouragement to you. I mean no disrespect by the use of the phrase “young men.” By many accounts, I myself could still be considered a young man. I use the word “young” only in terms of comparative age; I use the word “man” in terms of maturity. I welcome comments, feedback and input all along the way, but chose the right to delete or edit comments that I deem as disrespectful, rude, or not-profitable for discussion.